Georg Philipp Telemann wrote a ton of concertos, though the actual number recorded tends to be relatively (and by this I do mean relatively) restricted. Fortunately, in the past decade or so this shell has been breaking down, so that his enormous output is becoming available on disc at a rather steady rate. So too with the ocean of diverse chamber works, many of which have had an even more limited circulation. OK, so I’m skirting the issue of Telemann as Mr. Music of the period, whose reputation has emerged from being the generic Baroque composer to someone who plumbed the depths of every genre and style during his long life. But it does mean that, even with a burgeoning discography, there is still lots of material left to record as world premieres, as all but one of the works on this disc purport to be. The Concerto François represents one of his “nationalist” works, this time a five-movement suite or concerto grosso (one cannot decide which). The difference, I suppose, lies in the expanded opening prelude with its solemn dotted rhythms. The brevity of the following Allegro, based upon scurrying bass and violin lines above which the oboes offer parallel thirds, sometimes in suspension, seems to de-emphasize the French overture that one might expect. Instead of returning to the opening, there follows a mincing Louré and serious lament. In the final Allegro, the busyness of the second movement returns, this time with the oboes running about as well. Of the two trio sonatas, the D-Major for a pair of violins unfolds graciously in the beginning, only to morph into some impressive figuration in the Allegro that follows. This is a well-constructed if conservative work that gives the instruments a real workout. The final movement is a curious gigue that has some interesting rhythmic quirks. The G-Minor Trio for flute and violin also has much the same virtuoso requirements, though its opening is much more sedate, a louré that develops imitatively in cat-like steps. The string Concerto Grosso in B♭ is in a more modern three-movement format, and in the first of these the Baroque sequencing suddenly ends with what can only be a peasant drone. The second is an extended violin cadenza, and the third rushes about before vanishing into a soft nothing, with Telemann using his echo effect with considerable skill. Of interest is the twist into new harmonies using a brief unison at the beginning of the second section; the effect seems a bit more modern than one might have expected. On the other hand, the flute concerto is quite conventional, and even the solid minuet movement that suddenly has a central section in which the flute takes off with rolling triplets presto is not unheard of in Telemann’s oeuvre for the traverso (pace the well-known Suite in A Minor). The final Sonata in E Minor is really another suite or concerto grosso of five movements, belonging to the sort of instrumental compositions that Telemann wrote in abundance while in Frankfurt. The opening Grave has a steady arch form of chords that have some imitative moments and which have a hint of a minuet, all above a steady drone. The following movement is a rather complex fugue, severe and unyielding. I would describe the next, an air, as a folk-like tune with both oboes dominating in a Purcellian fashion before their nasal tone is briefly imitated by the violins. The finale is, of course, is filled with rapid sequencing, a suitable conclusion. This is lively and entertaining music, with enough harmonic and rhythmic twists to provide continual interest. Telemann is always the one who does the unexpected, even when he is doing repetitive sequencing, and each of these works demonstrates this talent. In so far as the performance goes, L’accademia giocosa is pretty much spot on, though on occasion the violins can sound a bit tinny. 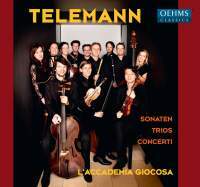 The ensemble is good, the oboes suitably forthright in their playing, and the textures vary subtly so that each of Telemann’s musical surprises is clear. In short, if you are collecting the vast oeuvre of this composer, these premiere recordings really should be a part. The playing is quite good and the interpretations give Telemann’s music the life it deserves.